On Sunday, October 7 at 3:00, Mexican novelist, poet, and playwright Carmen Boullosa will give a talk entitled “The Struggle is on the Walls: Antecedents and Inheritors of the TGP,” in conjunction with the opening of the exhibition El Taller de Gráfica Popular / The Workshop of Popular Graphic Arts. The talk will be held in Aaron Burr Hall, Rm. 219, and is open to the public free of charge. A reception will follow the lecture at 4:00. The Graphic Arts collection is fortunate to have acquired a small group of posters and fliers by the TGP (http://diglib.princeton.edu). A selection are on view until February 10, 2008 in the Milberg Gallery for Graphic Arts. The exhibition and associated events are made possible with the joint support of the Friends of the Princeton University Library and the Program of Latin American Studies. 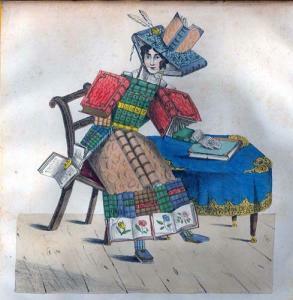 For more information, see http://www.princeton.edu/rbsc/exhibitions/milberg.html. Franz Hogenberg (1540?-1590?). 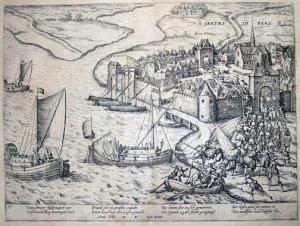 Geertruidenberg durch die Geusen entsetzt, 28 August 1573. 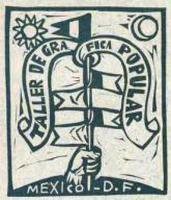 Engraving. On deposit from Bruce Willsie, class of 1986. Franz Hogenberg was a painter, printmaker, and publisher during the late renaissance. By the time he settled in Cologne in the 1570s, he had already begun a chronicle of the Dutch Revolt, also known as the Eighty Years’ War, through a massive series of engravings. The events depicted in these prints pre-date the protestant revolt, beginning with scenes from the 1530s and continue well into the 1600s. Although Hogenberg died some time around 1590, his son Abraham took over the work and completed the project. Father and son published their Geschichtsblätter (history papers) in various forms during their lifetime but happily, the entire work was reissued in a 1983 facsimile edition by Fritz Hellwig. [GARF Oversize D231 .H64 1983f] The series includes battle scenes on land and sea, portraits of the major figures, maps, ransacking of churches, hangings, elections, elegant parades, and brutal slaughters. When seen in chronological order, the prints take the viewer on an almost week-by-week journey through 16th- and 17th-century Dutch history. The German chemist, Justus von Liebig (1803-1873), made major contributions to agricultural and organic chemistry, and is regarded as one of the greatest chemistry teachers of all time. In addition to his academic work, he invented a way of producing beef extract from carcasses, which could provide a cheap, nutritious alternative to real meat (we know this today as beef bouillon). 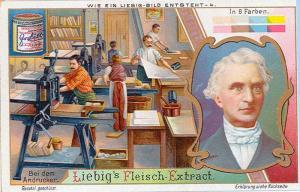 In 1865, Liebig formed the Liebig Extract of Meat Company and, like many companies at the time, had a number of trade cards printed to advertise his business. More than 1,900 Liebig cards have been documented, containing pictures of animals, landscapes, or portraits of historical figures along with the company logo. 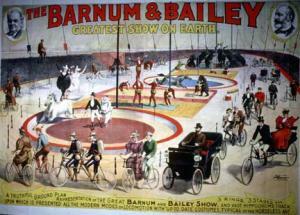 Continue reading From Beef Bouillon to Chromolithography. This month New York City celebrates the 50th anniversary of Helvetica, the sans-serif typeface developed in 1957 by Swiss designer Max Miedinger, with the opening of Gary Hustwit’s font documentary on September 12 (film screenings sold out in London so get your tickets fast). Here in Princeton we honor the serif and the English type designer William Caslon (1692-1766) with the acquisition of Caslon’s 1764 specimen book, the first to be issued in England. 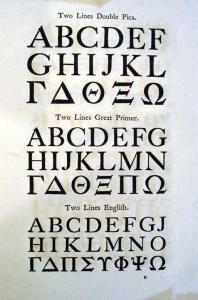 William Caslon and Son. A Specimen of Printing Types (London: Printed by Dryden Leach, 1764). Bound in contemporary lightly speckled calf bordered in double rules in gold. Third issue of first edition, reimposed in quarto rather than octavo. We are not alone in this. Benjamin Franklin used Caslon to set the U.S. Declaration of Independence and George Bernard Shaw famously insisted that all his books must be set in Caslon. William Caslon was born in the village of Cradley, in Worcestershire, and apprenticed at the age of 13 with an engraving firm. In 1716, Caslon opened his own firm in London, specializing in the engraving of gun locks and barrels. In 1720, Caslon accepted a commission to create a typeface for a New Testament in Arabic and his subsequent Roman typeface was an instant success. Caslon expanded his business into Britain’s first major type foundry. His son, William Caslon (1720-1778), continued the business after his father’s death and the Caslon foundry operated at the same location until 1909. Continue reading To Serif or Not to Serif. Olafur Eliasson. Your House. New York: Library Council of The Museum of Modern Art, 2006. Copy 135 of 225. “Reading a book is both a physical and a mental activity. It is like walking through a house, following the layout of the rooms with your body and mind: the movement from one room to another, or from one part of the book to another, constitutes an experiential narrative that is physical and conscious at the same time.” So begins Olafur Eliasson’s commentary in the prospectus for his 2006 book Your House, recently acquired for the graphic arts collection. This extraordinary artist’s book was published for the Library Council of the Museum of Modern Art in an edition of 225 and sold out within a week of its release. The subject of the book is Eliasson’s home in Hellerup, Denmark. Each page of the book has been laser-cut to reproduce a vertical cross-section of actual physical space of the house on a scale of 85:1 (so that each leaf corresponds to 2.2 centimeters of the actual house). The interior of the volume forms a sort of reverse to the traditional three-dimensional architectural model—a non-dimensional model formed of negative space—as well as an inverse to the traditional pop-up book. The physical volume is an oversize cube of perfect white paper. Outside of its colophon, the book’s 454 handbound leaves (908 pages) hold no words or printing, no color or inserted material; in fact, no images or marks of any kind. Only a complex series of holes cut into the paper, through which the reader looks. Unlike the tunnel books of the nineteenth century, there is no central image at the back that is the single focus of the book. With Eliasson’s volume every opening holds a unique view ahead into the coming pages and behind through the previous ones. 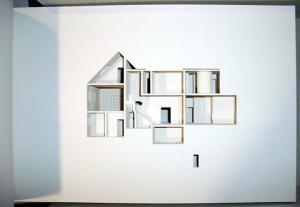 Continue reading "Your House" by Olafur Eliasson. Priscilla Susan Bury. A Selection of Hexandrian Plants: Belonging to the Natural Orders Amaryllidæ and Liliacæ from Drawings by Mrs. Edward Bury, Liverpool. London: R. Havell, 1831-1834. Elephant portfolio, bound in dark green three-quarter goatskin with green moiré silk sides. The other day I was looking for books by the botanical artist Priscilla Susan Bury (1799-1872) in our library catalogue. I now understand that one must first search under her husband Edward, where you will find a listing for Bury, Edward, Mrs. This will be Priscilla. Born Priscilla Falkner, in Rainhill, Lancashire, Mrs. Bury had no academic training in either Art or Botany. She grew up drawing plants raised in the greenhouses of her family home east of Liverpool. 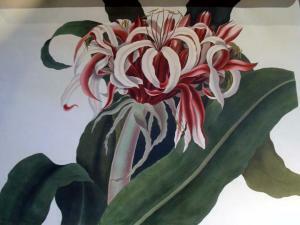 In 1829, she proposed to a few friends that she publish these drawings in a book called simply Drawings of Lilies. The drawings were to be lithographed and the book to be sold for 5 guineas. Amazingly, two years later the first of ten fascicles was indeed published, but with a new title and a new printing process. Now called A Selection of Hexandrian Plants, the job of reproducing Bury’s drawings was taken over by Robert Havell, Jr. (1793-1878). He used the same aquatinting process he was concurrently using to complete John James Audobon’s Birds of America. Like Audobon’s project, Havell reproduced Bury’s drawings on large plates (64 x 48 cm.) printed in vibrant colors and then, later finished by hand in watercolor. Havell was also the book’s publisher and Audubon was listed among its subscribers. It is unclear whether Bury subscribed to Audubon’s book. Continue reading One of the Great Botanicals.